When I first got married at 20, I wasn’t much of a cook. I was a very picky eater with limited cooking experience, and there were only a few recipes I really felt comfortable making: chicken divan, chili and meatloaf, to name a few. Nevertheless, I carefully wrote up all the favorites that my mom used to make at home, and I still have that little binder in a prominent place in my kitchen, ready for use when I’m feeling nostalgic. One of the recipes I brought with me from my parents’ house is for your standard banana bread. I know it came from a Southern cookbook, but I don’t remember its name now, and I don’t think my mom and I tried making any of the other recipes in that book. 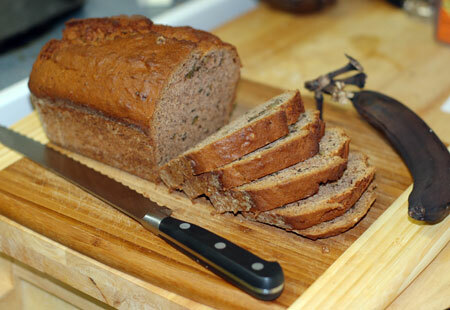 Perhaps we should have, because this banana bread has attained an almost legendary status in our home. We frequently buy bunches of bananas, ostensibly for Jeremy to eat out of hand (I don’t care for plain bananas—way too mealy and mushy), but somehow they always end up languishing on the counter until they are too black and gooey for anything but baking. And Jeremy won’t let me experiment with banana bread recipes. 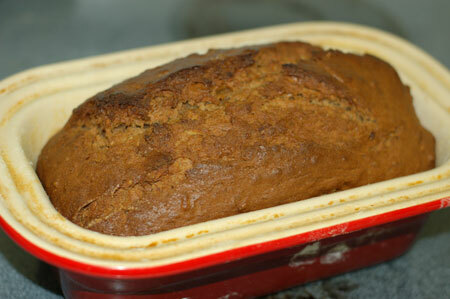 Ever since the first time I made him a loaf of banana bread from my childhood recipe, that’s the one he wants. Oatmeal or crystallized ginger doesn’t interest him, and even chocolate swirls don’t tempt him on the subject. The man is steadfast. I’ve gotten very serious lectures on the subject. 🙂 He even considers banana muffins or banana cake a waste of bananas that I could be using to make banana bread. Every so often, I still try to sneak something new under the radar, because after a while, the same old recipe starts to chafe. But who am I to deny my aficionado his banana bread? Cream butter and sugar together, add eggs and beat well. Mash bananas and add to butter mixture, then flour, soda, salt, and spices. Mix just to blend and fold in nuts. 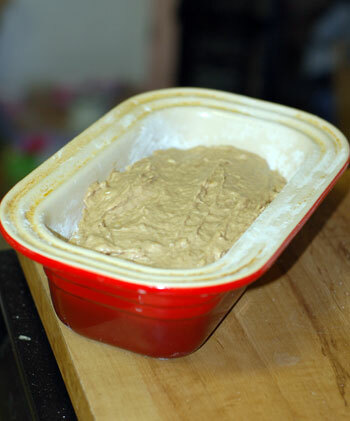 Bake in greased loaf pan at 350F for 1 hour or until top is browned and inserted toothpick comes out clean. Update 7/29/10: I’ve finally found a variation on the banana bread that Jeremy likes. I had a little extra streusel left over from making a batch of allspice crumb muffins, so I used it to top a loaf of banana bread a few days later. The next time I made banana bread, he requested streusel on top, so I whipped up a small batch: 1/4 C flour, 1/4 C brown sugar, 1/2 tsp each cinnamon and allspice, 3 T butter. Just blitz it all together in the food processor; if you want fine crumbs, start with cold butter, and for a chunkier texture, use melted butter. This actually beat out the suggestion of adding chocolate chips to the banana bread, and may be the only recipe for which my husband has consistently turned down the addition of chocolate.